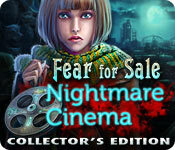 Fear for Sale: Nightmare Cinema Collector's Edition is rated 4.4 out of 5 by 105. Rated 5 out of 5 by Majestyx12 from Missing Elefun A co-workers fiancé contacted me that Adam was missing and she needed my help. She was given a ticket for a closed cinema and I try to take her place to find Adam. I bought this CE game at the last BOGO because I was missing Elefun and because it has 101 collectibles, with morphs in the count. I played the main game already because I had the SV. It's a older game. It came out April 2013. It's the fourth in the series. I love list hops and this one has 25 of them. Out of the 30 puzzles I played 24 of them. It has 35 collectibles and 66 morphing objects that they added together in the guide for 101. It's long with 7 chapters + bonus chapter. It has multiple scenes and most aren't closed off to visit. The map is good and helps you travel. The bonus chapter has you help David McInroy. I liked this game more than lots of the newer games. Rated 5 out of 5 by upsysydaisy from Stay Away From Old Movie Theaters !!! I thoroughly enjoyed Nightmare Cinema from start to finish. The storyline was very good and easy to follow throughout the game. It was a very full and busy game with lots of tasks and locations to go to. Your goal is to save all the souls that have been stolen from the theater patrons by the evil Aggel and the projectionist who is possessed by him to help take over the world. I thought the game was overflowing with wonderful artwork. All the scenes were so bizarre and just absorbed my attention to the max. Sometimes I am in awe of the imaginations that are capable of creating such fascinating pieces of fantasy and "extreme" art. My game time could have easily been cut in half had I not been so caught up in the scenery. My time for the main game was shown at the end as being 16 hrs, 5 min. Good grief !!! Loved the music. The map was great, eliminated all stressful running back and forth which we all hate. Diary was good, each event was entered along with pics, I found it very useful. Hint system worked very well. Locking inventory which is always a good feature. Graphics and color, script which was minimal were excellent. There are 66 beyond objects and 6 categories of collectibles, each containing 5 objects which you can keep track of if you go to achievements. You earn points for each accomplishment which flashes on your screen to keep you advised. A great feature, IMO...made it more fun. These collectibles and beyond objects appear in the scenes and HOPs. When you revisit a scene that your map indicates, you may find additional ones. You really have to have a sharp eye, there is so much to look for and sometimes hard to spot. Just click away and you will find! I clicked just about everything so I could achieve big. It was fun to challenge myself. 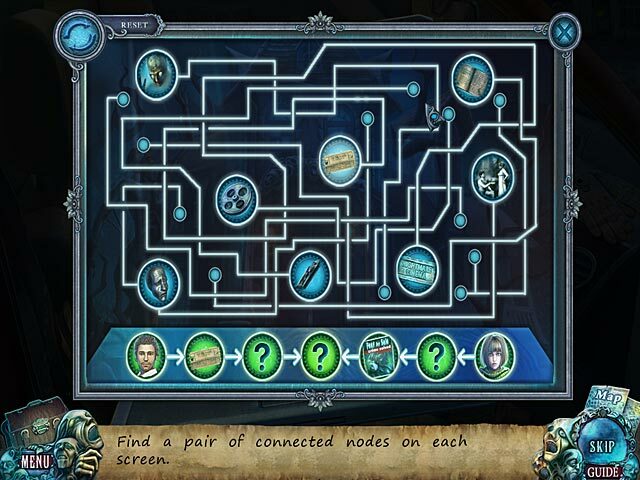 The HOPs and games/puzzles were the best and unique and quite interactive. There is a very involved game of mixing potions that I loved. I was stuck on it a long time and finally had to use the guide and write down the instructions. But that was the only time the guide was ever needed. The story continues and comes to its ultimate end in the bonus chapter, and still be on the lookout for the collectibles. The game came to a satisfactory end... the souls returned to everyone and they woke up unharmed. No blood or frightful sights, the demon Aggel was aptly destroyed and the theater went up in smoke !! HURRAY ! I finished recently, Sunnyvale and McInroy Manor. Nightmare Cinema outshines them by leaps and bounds! I am anxious to play all my other Fear for Sale games. You might absolutely hate this game or find it too this or not enough that. But for me, it was absolutely superb and I, of course, highly recommend it. Thanks to everyone who takes the time to write their reviews, whether they be good or bad. I cannot nor will I ever buy a game without reading all the reviews. They are always a great help in making my choices...so, THANK YOU. 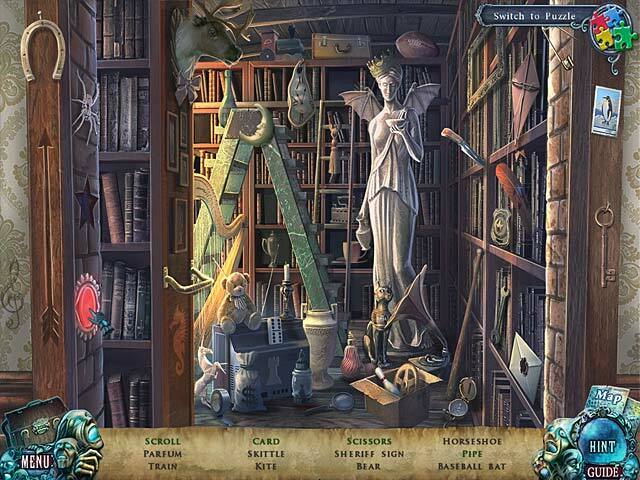 Rated 5 out of 5 by maggied45 from Fantastic Game Full of Fun, Horror and Hidden Objects I've played this twice so far - and I love it. A mix of horror and a bit of humor in the HOGs, fit well with the very well laid out storyline. Traveling around the scenes never gets tedious because of the way they place the objects - although - don't get me wrong - it's not too easy. I finished the game on a custom level which enabled hints (that I only used twice) but did not include glitters - in about 3 hrs. Rated 5 out of 5 by sapoe from another good games from EleFun Wow! This game is really fun until end. I love the dev bring another McInroy family so I can't wait for another sequel. And please make it more creepy like the first game. Thank you EleFun and keep work hard! Rated 5 out of 5 by StewieG23 from Excellent addition to Fear for Sale series Is an excellent followup to the first two games. The graphics were amazing and the story was interesting. Also, there were both collectables and beyond objects to find and achievements too! I liked the fact that you could customize how hard you wanted the game to be. For example, you could choose if the HOS sparkled or not. Was just an awesome game!! Rated 5 out of 5 by catdroid from Really excellant game and creepy This is a good solid game with very imaginative but creepy graphics. I was both attracted and repelled by them. 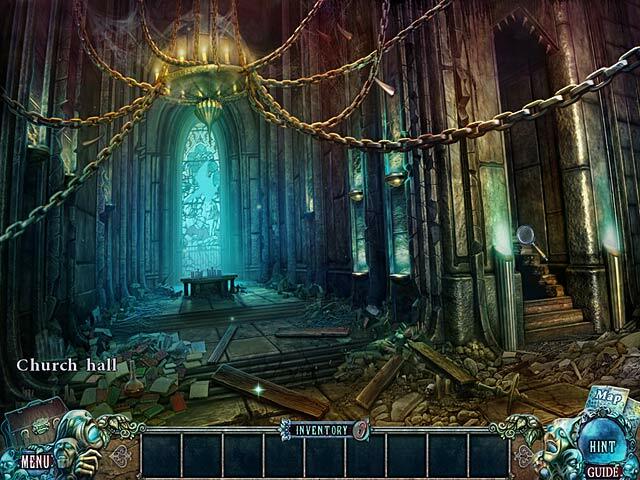 Very long playing time Music enhances the creepy factor Great HO"S Loads of puzzles Interactive map (which you need) Many locations You have to think about what to do next I usually don't like creepy games but this one is something special. Buy the CE and enjoy the journey. Rated 5 out of 5 by marm56 from ONE FOR YOUR COLLECTION good graphics; good play; interactive map; not too easy. get the demon and save souls It was a visually stunning journey in search of a love through theater HADES. LOVED IT! LOVED IT! LOVED IT !